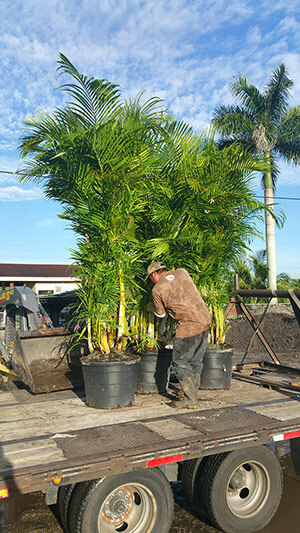 Shopping for wholesale palms in Tampa Florida? At A Quality Plant we are the leading farmers of wholesale palms in Florida! Wholesale Palm tree farming for the state of Florida, especially the Tampa market, requires us to be versatile for this sub-tropical market. Tampa Bay is a distinctive location in Florida with regards to selling and growing palm trees.This area of Florida is great for tropical and cold hardy palms in the same landscape. In tribute to the closeness to the Gulf of Mexico and the position of the land masses around the Tampa Bay Area, locations closer to the water have more temperate winter conditions than further inland. Because of this the Tampa Bay Area can sustain a more diverse selection of tropical palms and cold hardy palms. Foxtail palms are a great choice for the coastal areas of the Tampa Bay area. They are a fast-growing palm that is successfully used in small spaces as a specimen and does well in zones 10b-11. Exemplifying the tropical image while remaining cold hardy is the trick this palm successfully pulls off! It has the frond of a coconut tree, with no coconuts and the trunk is ringed, similar to that of the Veitchia Montgomery mentioned above. The Pindo Palm / Jelly Palm / Butia capitata is beautifully tropical as well as cold hardy down to 26°F. Call the top palm tree farm in Florida with a stellar reputation. A Quality Plant is ready to help and available Monday - Friday to speak with you about wholesale palms if you’re looking to buy.